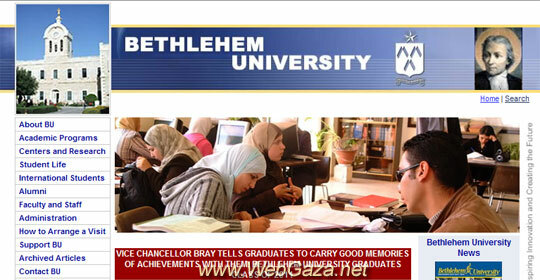 Bethlehem University - What is Bethlehem University? Bethlehem University is the first university founded in the West Bank, Palestine. Bethlehem University traces its roots to 1893 when the De La Salle Christian Brothers opened schools in Bethlehem, Jerusalem, Jaffa, Nazareth, Turkey, Lebanon, Jordan, and Egypt. It is a Catholic Christian co-educational institution of higher learning founded in 1973 in the Lasallian tradition, open to students of all faith traditions, located in Bethlehem, West Bank. Bethlehem University of the Holy Land is a Catholic Christian co-educational institution of higher learning founded in 1973 in the Lasallian tradition, open to students of all faith traditions. Bethlehem University, the first university established in the West Bank, and can trace its roots to 1893 when the De La Salle Christian Brothers opened schools in Bethlehem, Jerusalem, Jaffa, Nazareth, Turkey, Lebanon, Jordan, and Egypt. During the historic visit of Pope Paul VI to the Holy Land in 1964, Palestinians expressed their desire to establish a university in their homeland. After consultation and study, and in the midst of the post-1967 war era which resulted in the West Bank and Gaza Strip being under Israeli military occupation, it was in 1972 that the Apostolic Delegate, Archbishop Pio Laghi, formed a committee of local community leaders and heads of schools in the West Bank, including East Jerusalem, to establish an institution of higher learning which would offer a broad and practical university education in arts and sciences to meet the needs of the Palestinian society. With the support of local educational leaders and the cooperation of the Vatican’s Congregation for Oriental Churches and the De La Salle Christian Brothers and their colleagues who have conducted schools in over 80 countries of the world since 1680, conducting universities in the United States since 1853 and schools in the Middle East since 1893, Bethlehem University officially opened its doors on 3 October 1973, becoming the first university in the West Bank. The University is located on 8.67 acres (35 dunams) of the De La Salle Brothers property on Fréres Street at the highest point in the town of Bethlehem. Beginning with 112 students during its first year in 1973, sixty-three students graduated at the first full graduation ceremony in June 1977. The enrollment of the University increased steadily reaching 1,000 in the Fall of 1981, over 2,200 by Fall 2000, and establishing a record high of 3,054 in the Fall 2009 semester. The University expanded its facilities to meet the needs of the growing student body: Library in 1978; Mar Andrea Women's Hostel in 1979; Science Wing in 1980; Social and Cultural Center in 1990; the Institute for Community Partnership in 1991; Bethlehem Hall for the Nursing and Education faculty in 1995; Turathuna: Palestinian Cultural Heritage Center in 2000; and Millennium Hall for the Arts and Business Administration faculty in 2002. The highly academically qualified and dedicated Palestinian faculty and staff along with their international colleagues of lay men and women, De La Salle Christian Brothers and members of various religious orders of sisters and priests, grew to meet the developing needs of teaching, research, community service and administration at the University. The Education Faculty and the Institute for Hotel Management and Tourism were among the University's first distinctive programs. The Faculties of Arts, Science, Nursing and Business Administration also grew in response to the needs of the community as did the Institute for Community Partnership, offering continuing education and professional development programs. Bethlehem University was one of the founding members of the Palestinian Council for Higher Education in 1978 and continues membership with the Ministry of Education and Higher Education resulting from the coming of the Palestinian Authority in 1995. In October 1979 a Board of Trustees was established and in May 1981 Bethlehem University became a member of the Association of Arab Universities. Bethlehem University also holds memberships in the International Federation of Catholic Universities, Lasallian Association of Colleges and Universities, and the International Association of Universities. Despite being closed twelve times by Israeli military imposed orders, the longest of which was for three years from October 1987 until October 1990, classes have continually been held on- and off-campus. The curfews, travel restrictions, military checkpoint harassment, and the negative impact of the Israeli military occupation of the West Bank, are factors faced by the University’s enrollment of 2,936 students, most of whom are full time, and 11,470 graduates, most of whom are serving the Palestinian society in the West Bank, East Jerusalem and Gaza in various professions and leadership positions. The University’s story is one of people committed to pursuing their higher education – perseverance and courage in the face of adversity and injustice – working together in hope with an ever widening international circle of colleagues to build a better future.